Why does my iPhone display “TFW” or “HOME” in the top left status bar instead of AT&T, Verizon, Sprint or T-Mobile? If you are a Straight Talk, Net10, Simple Mobile, Total Wireless, or Tracfone customer using an iPhone you may be wondering why you see HOME or TFW displayed in the left hand corner of your iPhone’s status bar instead of AT&T, Verizon, or T-Mobile. This text, known as the Carrier Name, shows your wireless carrier’s name. TFW is an abbreviation for Tracfone Wireless. If you didn’t know, Straight Talk, Net10, Simple Mobile, Total Wireless, or Tracfone are Tracfone brands. Many people ask me if their Straight Talk, Net10, or Tracfone iPhones are using the AT&T, Verizon, Sprint, or T-Mobile network then shouldn’t their iPhone display the actual network it’s using? And well the answer is, no. The Carrier Name is meant to show the brand name for your wireless company, not the actual network you are connected to. So maybe you are wondering, then if I am using Straight Talk or Net10, the why doesn’t my iPhone display Straight Talk or Net 10 instead of TFW? That’s a great question too, and the answer had to do with way the Carrier Name gets set. Your wireless carrier uses Carrier Settings on the iPhone. Carrier settings control carrier-related settings, such as the Carrier Name, network, calling, cellular data, messaging, personal hotspot, and voicemail settings. You can see which which Carrier Setting version your phone is using by looking in Settings > General > About. 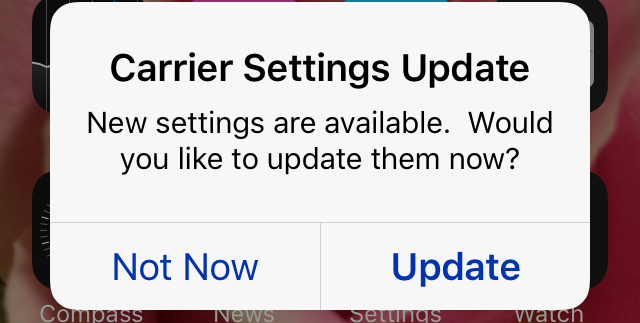 You may receive notifications from time to time to install new carrier-settings updates. You may have seen this notification before. For whatever reason, Tracfone has chosen to use only have one carrier settings bundle for all three brands: Tracfone, Straight Talk, and Net 10. Perhaps Apple had a say in this. Rather than have three different settings that only differ in the name they have one. Can I Change TFW or HOME to say AT&T or Verizon? Unfortunately, you cannot change the Carrier Name on your iPhone. In the past, it was possible to edit and install the carrier settings yourself. You could make your iPhone display whatever you wanted it to say. For example, I could have changed mine to say “smartphonematters” or “Bob”. Sometime in 2014, Apple stopped letting users install carrier settings files manually for security reasons. 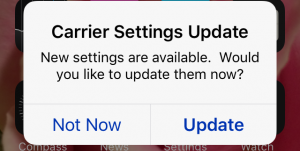 If for some reason, you really want to change the Carrier Name you may be able to if you jailbreak your iPhone, but that is beyond the scope of this article. What about you? Which network are your using? What Carrier Name does your iPhone show? Leave a reply below and share. My phone carrier is Walmart Family mobile which is part of t-mobile. But in the top left hand corner of my iPhone 7plus, it says TFW LTE. I don’t understand why. It used to say Family Mobile. This isn’t a problem. Your phone will continue to operate the same, the only thing that changed is the network name in the top left corner. Walmart Family Mobile was originally created as a joint venture between Walmart and T-Mobile. After the first couple of years, T-Mobile sold or transferred Family Mobile to tracfone. Family Mobile still uses T-Mobile’s network, but Tracfone has owned it for years. While they don’t tell us why, I suspect it simpler for tracfone to use TFW, rather than having to work with Apple to make sure all the different brand names they use are displayed i.
I might be able to offer some suggestions, you did not share what phone you have, and which of the three different networks your phone is using. If you don’t understand how Straight Talk works, How To Sign Up and Use Your iPhone 6 or 6s with Straight Talk Wireless/#part2. Please note, I don’t work for Straight Talk, so if you think you need to change to another carrier that offers service in your area I think that is a good idea. My new iPhone XR and straight talk also new numbers. Removed old iPhone under Verizon. Didn’t tell Verizon about my changing into TFW but they set old numbers back on this iPad. I checked often and removed. I thought about WiFi as old numbers is a password. Should I tell Spectrum to change the password on WiFi cable modem? Guy was here and knew how to help me with iPhone. It is back on. I find your comment a little hard to follow. I am not sure what you are asking me. The carrier I have is Safelink, it shows TFW in my display. Is Safelink a part of Tracfone as well? Yes. Safelink is a one of the many Tracfone brands. on the iPhone the carrier name is set by the carrier bundle. Most iPhones will show TFW. Sometime you need to agree to install the bundle. I recently got the iPhone x and my carrier is Straight Talk. But I can’t access my personal hotspot as it tells me to set it up on TracFone and sends me to a website which doesn’t even exist anymore… Do you know of something I can do? Straight Talk does not support hotspot. It violates their terms of service. Using Personal Hotspot with Straight Talk. I recommend choosing a prepaid carrier that offers hotspot if you need it. Question: I was told I bought an unlocked phone. When put in my Verizon SIM it wouldn’t work stating the SIM wasn’t associated the the network; or something to that effect meaning it’s carrier locked. Without a SIM inserted is says in settings>general> about> Carrier TFW 34.0. How do I find which is the carrier if there are several possibilities? Straight talk, Trac, Net10 etc…? Without the SIM inserted under settings>cellular> no SIM. I need this phone to work on Verizon network. OK. I’m assuming you bought an unlocked iPhone and put an already active Straight Talk verizon SIM in it. ‘s Verizon network and if it is, then transfer your service to from your current phone to the new iPhone. As part of transferring your service, you may be required to get a new SIM. You can order one from Straight Talk for $1. Without knowing the exact error message you see it’s difficult to say what the issue is. Keep in mind that you’ll need an iPhone that is compatible with the Verizon networks. Some are compatible with all networks. Others are not. For iPhone 7,8, and X there are models that only work with ATT and T-mobile. If you have a friend that uses Verzion or AT&T, you can try their SIM in your iPhone and if you can make a call, the phone is likely unlocked. If you have a link to the phone you bought I can take a look at it. I use SimpleMobile as my provider, and that’s the name used to show on the upper left corner. I haven’t changed providers, and since like almost a month ago it’s been showing TFW. I tried to change it back to SimpleMobile (I have the option still), but after selecting SimpleMobile, goes back to TFW. Simple Mobile is owned by Tracfone Wireless, don’t worry about it, its not a problem. hi , so recently i updated my phone, is tfw carrier able to recieve all messages and calls through another phone? I’m not sure I understand your question. I explained in the article that they just changed the carrier name its the same service. I bought my iPhone at a Walmart website. It said “PREPAID STRAIGHT TALK IPHONE SE 32GB” so does that mean I can use any other carrier instead of Straighttalk? For example if I choose to walk in a T-mobile store they would accept that I pay for a monthly service ? No. If you bought a Straight Talk iPhone from Walmart the phone is activation locked to Straight Talk. After using it for 12 months, Straight Talk will unlock it for free. If you already opened the phone, you could try an ATT sim in the phone. I don’t think it will work though. If you haven’t opened it return it unopened. Thank you for the information, i have Family Mobile with T-Mobile Network and my phones says Familymobile now my iPhone updates to iOS 12 and changed the name to TFW. Originally Family Mobile was a joint venture between T-Mobile and Walmart. T-Mobile eventually sold it to Tracfone. Straight Talk only operates in the USA does not support international roaming. If you choose a prepaid wireless carrier that offers wi-fi calling, you may be able to use your phone with a Wi-Fi connection. Straight Talk does not officially support Wi-Fi calling. It appears to work on some phones, but not supported. I use to get great coverage at my house last year, but this year it is VERY speratic. I have StraightTalk. My friends who have at+t get EXCELLENT cover in the same spot. WHY ???? I don’t know. I assume you are using Straight Talk’s ATT towers. Try swapping SIMs with a friend and see if they get poor coverage with ST and you get great coverage with ATT and your friends poor coverage with Straight Talk. Straight Talk ATT network is prepaid service, and there are some differences between that and ATT’s postpaid service but unless you live in a rural area, your unlikely to notice the difference. Are you using a BYOP or a Straight Talk phone? On the iPhone, the TFW is just a name they display. They could have just left it saying Verizon or something else. The don’t change it for android phones. There are differences between Verizon and Tracfone’s Verizon towers. Straight Talk is prepaid wireless service and it does not have all th features of Verizon’s post paid network. For example, mobile hotspot. Is Visual Voicemail working on your iPhone? If you live in an areas where you had goos coverage on the Verizon network, you should see the same coverage on Straight Talk. page plus is also owned by tracfone.